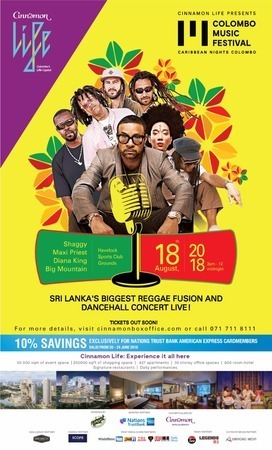 Sri Lanka's biggest musical festival cinnamon life presents Colombo Music Festival 2018. 9 hours of entertainment,- Caribbean Night' -, featuring Shaggy, Diana King, Maxi Priest and Big Mountain. Debuting in August, this annual event, with its state-of-the-art set up, unforgettable line-up and innovative engagements, will give a contemporary festival experience with a truly global feel, redefining the city's concept of entertainment. It is a glimpse of what Cinnamon Life represents best - the very epitome of vibrancy, exclusivity and inspired living in modern South Asia. Countless food and beverage stalls will ensure that festival-goers can purchase and stock up on food, snacks and drinks such as alcoholic beverages and even bottled water to keep yourself happy and hydrated throughout the duration of the event.